VENDING machines are contraptions that provide shelf-stable foods, usually drinks and snacks such as chips, cookies, chocolates, bottled drinks, and others. The concept of vending machines is usually as a convenient way for the buyers to purchase items without going to stores or supermarkets, and more often than not these items are for their personal consumption. However, it is not everyday we get to see a vending machine that provides neither snacks nor beverages but meaningful things such as food for the hungry, eyeglasses or hearing aids for needy kids, school supplies or lifesaving medicines. And last month in SM Megamall Building A, Manila, I got the opportunity to help someone in need, and it was as easy as buying a can of soda. 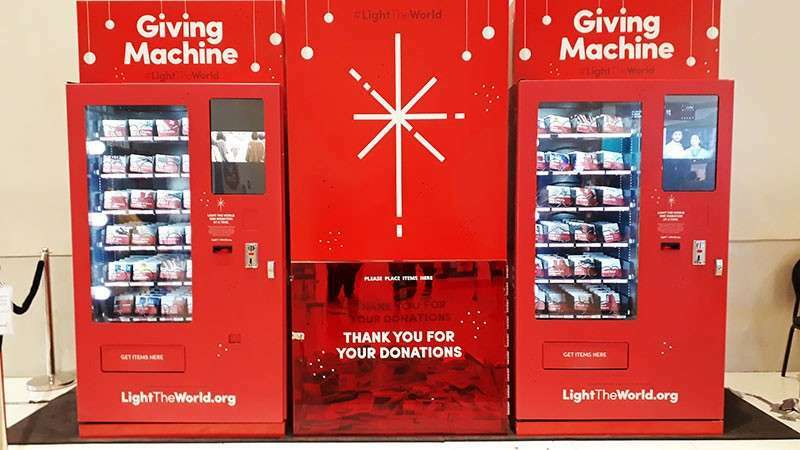 As part of the #LightTheWorld campaign of The Church of Jesus Christ of Latter-day Saints, with its theme: "Give as He Gave," these contraptions called "Giving Machines" are not your typical vending machines as apart from the selection of items inside, the purchaser will not be buying them for themselves but for other people who most needed them. You could say it’s a convenient way to donate, with you not needing to carry or bring anything. Just insert your money in the slot, select the item of your choosing, and the machine will dispense the card which indicates what kind of donation you will be giving. You, then, slide in the card in the donation box. "You just donate the money and 100 percent of those proceeds will go directly to that charity to help those people in need in our community," Sister Tindall, a missionary of The Church of Jesus Christ of Latter-day Saints (LDS) who was assigned to assist in the Giving Machines area, said. 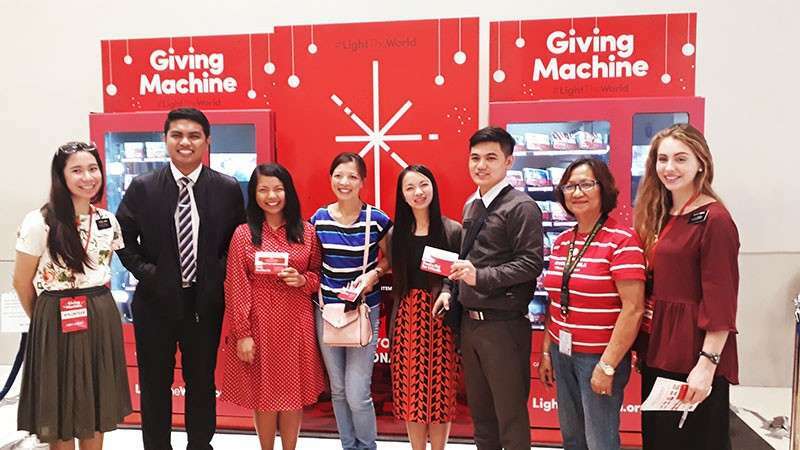 According to Sister Tindall, the LDS has partnered with three local organizations which are beneficiaries of the Giving Machines project: the Caritas Manila, UNICEF Philippines and The Purple Centers Foundation. Among the items available for purchase in the giving machines are: vitamin supplements, eyeglasses, hearing aids, school supplies, safe water kit, child nutrition kit, teaching supplies, feed a kid for one month, feed a family for 3 days, first aid kit, hygiene kit, family drug counseling, home repair tools, college books and supplies, 1 week college allowance, kids rubber boots and raincoat, pair of shoes and socks, art kit, school backpack, soap and towel, among others. Adults and even children can purchase these items as the price range for them starts at P30 to P2,000. One hundred percent of the donation will be used for the purchased item or for similar items or services of greater need as determined by the applicable charitable organization. "It’s a very unique vending machine and will surely be a blessing to your family as well as your children as they learn to pick out a gift and give it to someone, something that is of their choice," Sister Tindall said. She added that the distribution of these donations will start as soon as the charities were able to collect their respective items. 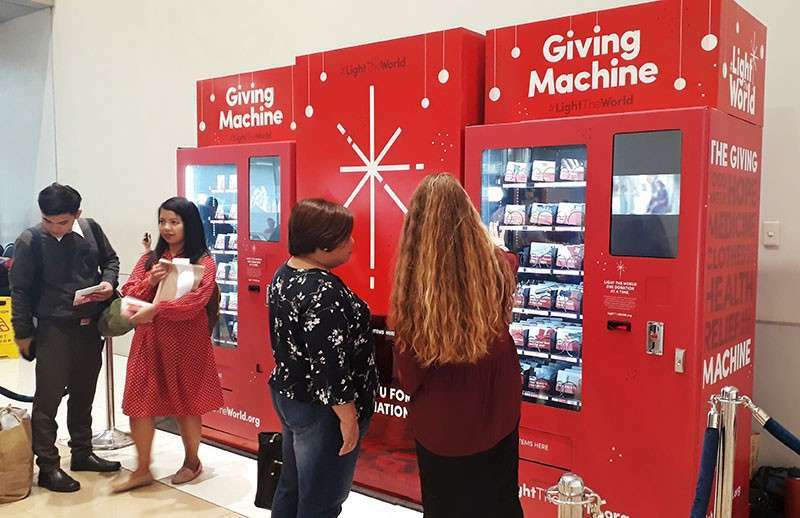 The Giving Machines at SM Megamall Building A in Manila, operated from November 23 until December 31, 2018, and were the first and only giving machines not just in the country but in all of Asia. Luckily, I was able to donate when I went to Manila last month. I also observed several people stopping by the giving machines and purchasing their items. It truly piqued my interest, as such, when I asked if there will be giving machines for other parts of the Philippines apart from Manila, Haidi Fajardo, the area director of public affairs of The Church of Jesus Christ of Latter-day Saints, said that they are hoping for the possibility of this happening in the near future. As the Church believes in following Jesus Christ through "acting as He would act and loving as He would love," the #LightTheWorld campaign, through the giving machines, is just one of their ways to encourage people to give or share, to make a difference in people's lives through helping them in simple ways. "We celebrate the life and the mission of Jesus Christ who is truly the light of the world, who has come so that we may have light and life. Jesus Christ is the true light of the world and we follow Him and we follow His example," Sister Tindall said. 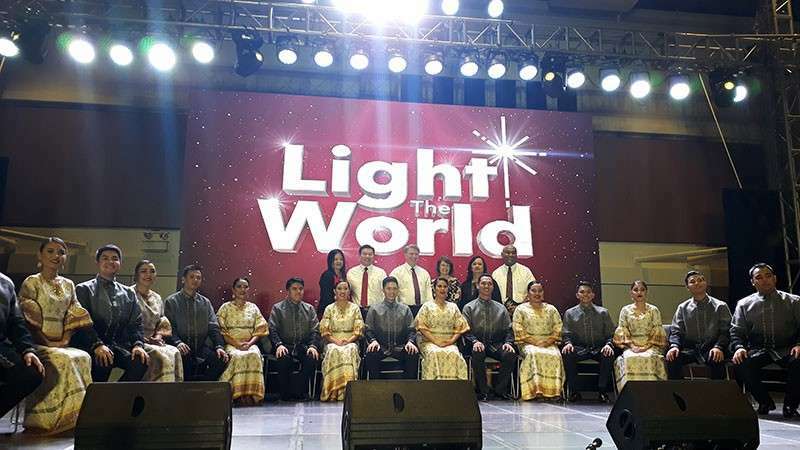 Also part of their #LightTheWorld campaign is the Light The World Train, which is a Light Rail Transit (LRT) covered with the campaign logo and color on the outside and the inside is filled with advices or suggestions that encourages its riders to give way, give more and share Jesus Christ's light to others. 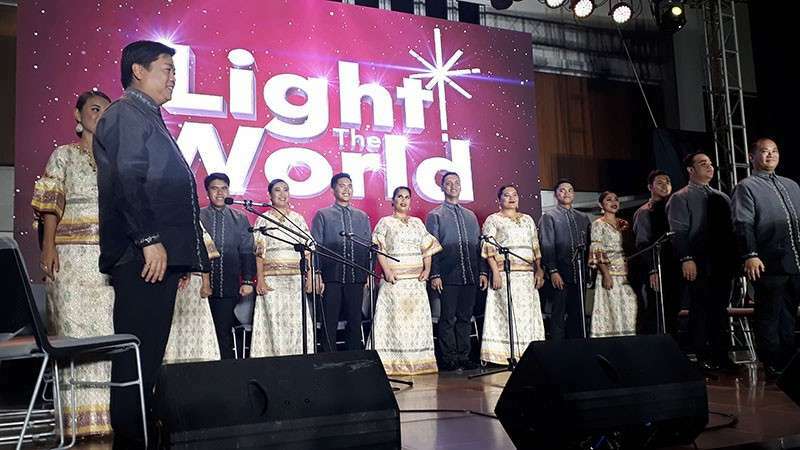 Another part of the Church's campaign was a series of concerts wherein four choir groups serenaded the audiences with Christmas carols. 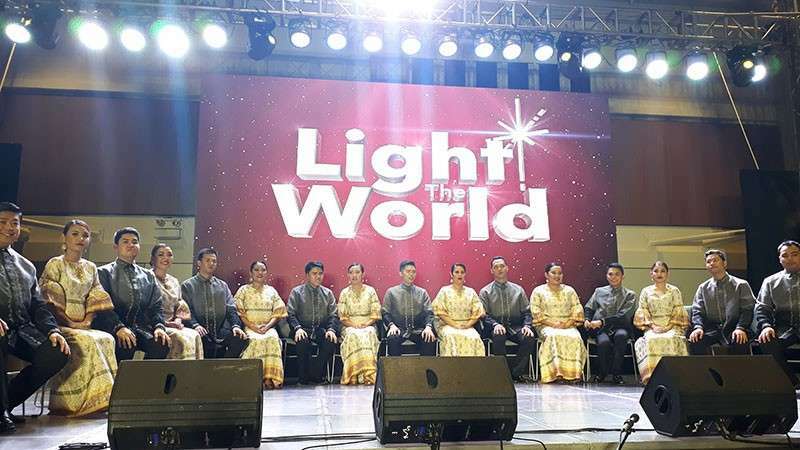 The University of the Philippines Medicine Choir performed last December 1, Cagayan de Oro Stake Combined Choir last December 8, Philippine Madrigal Singers last December 15, and Makati-Mandaluyong Stakes Combined Choir last December 22. With the success of the #LightTheWorld campaign in 2018, it will be exciting to think what will happen for 2019's campaign.